Command-N will host a new event "Alternative Tokyo: Dada-things-up a bit!/01" on Saturday 29th March, 2008, at our project site, Kandada. This project is a 'contest' of presentations without purpose - what we might call a "Symposium of Expression". In this first meeting, we have no idea of how the event will develop, but then neither do our presenters. What we hope for here is to see each presenter's passion; their passion to get 'something' across, their eagerness to show, to talk about, or make moves to do something, that is what we want here. Success or failure is irrelevant. We invite our participants all to witness only what happens here and now. On 29th March, Command-N will invite a host of exciting creators from the various fields of contemporary art, graphic design and fashion to present their ideas to us all, and to do so in only 10 minutes! 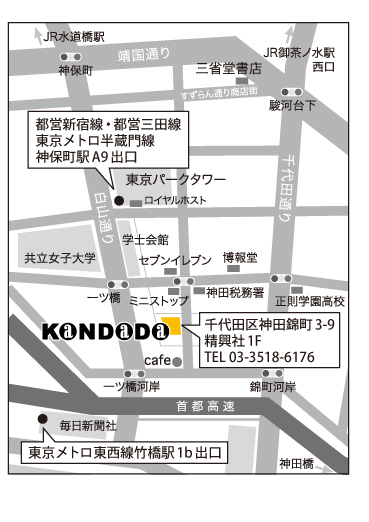 Alternative Tokyo: Kandada will be the place to "Dada" things up a bit!